Habitat for Humanity LBPC is delighted to announce that the Jim and Lenka Coyne family of five has consented to partner with us in a like-new rehabbed home on Shabbona St. in Streator. 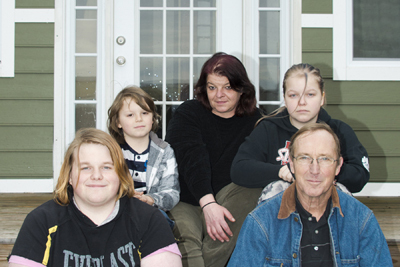 James, Kuba, Lenka, Kelly & Jim are shown (from left to right) on the front porch of their newly completed home. This solidly built three bedroom home has new electrical, window, heating and air conditioning systems. The kicthen has new cabinets and the bathroom is also new. New siding and roofing has been installed. Hardwood floors are being refinished to like-new conditions. New appliances are being provided to the Coyne family. Habitat would like to thank the volunteers and contributing individuals, families and organizations who have made this fourtenth house a success. Our contributing organizations can be found on our Sponsors page. 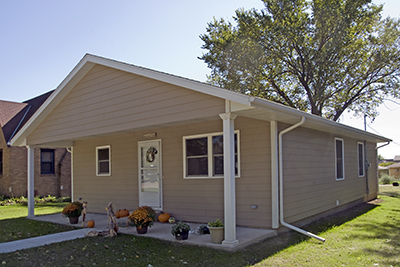 Habitat for Humanity LBPC completed house project # 13 (our first ever rehabbed existing home) in 2014. 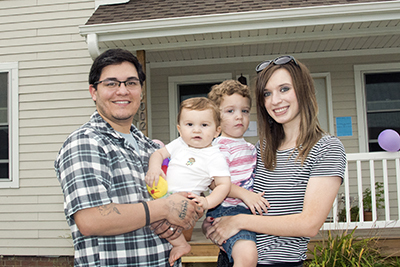 The Enrique and Ashley Diaz family of four is continuing their partnership with Habitat and are living in their Hall St., Streator home. They are all very excited to be first time homeowners. The Diaz family is shown (left) in front of their home with two year old Reece being held by Mom. Please consult this web site and local media for more information on home ownership opportunities. Qualifying information appears on the Homeownership and Home pages of this web site. During the late summer of 2012, Habitat's latest new home on Superior Street in Ottawa was completed. Our Family Selection Committee, after much deliberation, selected the Monica Snell family to partner with Habitat. The Snell family accepted and are excited to be in their new home. Monica is shown (right) holding Tommy along with Noah and Hannah. Our local affiliate of Habitat for Humanity has completed five new homes and one rehabbed existing home for six partnering families during the last six years. These homes are in Princeton, Spring Valley, Granville, Ottawa, Ottawa again and Streator. The first of these Ottawa houses was occupied by the Theissen family shortly after Labor Day of 2010. 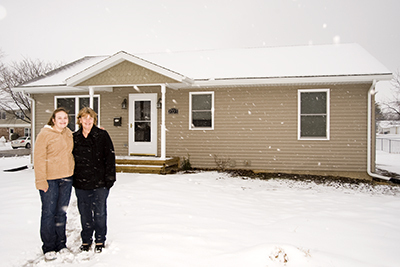 Two previous Habitat homes had been built in Ottawa for Ottawa families before 2010. The house pictured to the left is the new Ottawa home of Carl and Blair Theissen and their three daughters. The Theissens are pictured (below-right) in their new kitchen during the House Blessing service for their new home. Ed Thorsen of Thorsen Builders served as Site Supervisor on this project. He used his expertise and contributed hundreds of hours of hard work in making this a very successful project. The Habitat Project Manager for this home and three others was Mike Knapp. Mike oversaw the construction of this home with assistance from David Wheeler of Ottawa's Golden Rule Lumber. Sally Van Cura is our Executive Director and can be reached through our local Habitat office phone at 815-434-2041. The Building Trades classes of Ottawa Township High School, under the direction of instructor David Keely, installed much of the siding, soffit and fascia and did other exterior construction and installations. Representatives of the James Hardie Co. assisted Mr. Keely with student instructions. The Theissen family and friends contributed hundreds of hours of sweat equity while qualifying for their home. Many of the companies and organizations that have contributed to recent Habitat projects are shown on our Sponsors page. All ten of our completed local single family homes and a two family duplex are pictured on our Properties page. Sara Mae Baker and her sons Josh (left) and David are shown at the blessing of their new home in Granville on December 19, 2009. 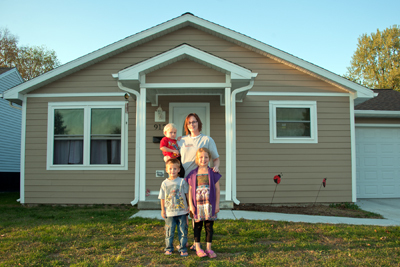 The Baker family moved into their new three bedroom house with attached garage in time for Christmas. The Bakers no longer need to climb 87 steps in order to enter a small apartment. 86-year-old Site Supervisor Joe Panier (left) is largely responsible for the completion of the Baker home. Mike Knapp served as Project Manager. Pictured (right) is the new Spring Valley home of Alicia Avila and daughter Leslie. After a full year of planning and hard work by Site Supervisor John Andes, dozens of volunteers, many local businesses and the Avila family, the Avilas were able to occupy their new custom-made home during the Summer of 2009. Kate and Sarah Bombliss (right) are in front of their new Princeton home. They moved in just before Christmas of 2008. Joe Bell of Key Builders Construction served as Site Supervisor and contributed almost a year of his weekends to complete construction of this house. 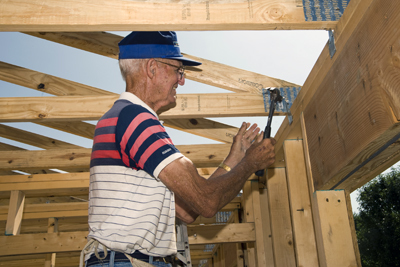 Mike Moore of First State Bank was Habitat's Building Committee Chairman for both the Bombliss and Avila homes. Duane Carpenter of Normal (formerly of Granville) served as our local Habitat affiliate president and was a driving force behind the construction of these two family homes. The Thrivent Financial For Lutherans group contributed a monetary grant and organized volunteer worker groups from area Lutheran and other denominations of Christian churches to make this project possible. 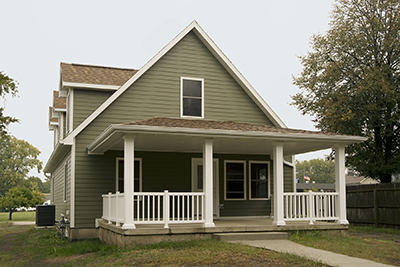 Habitat for Humanity- LBPC has finished it's 12th new family home at 912 W. Superior St. in Ottawa and has completed work on it's 13th & 14th home, two rehabbed homes in Streator. Please watch this website and local media for further news.